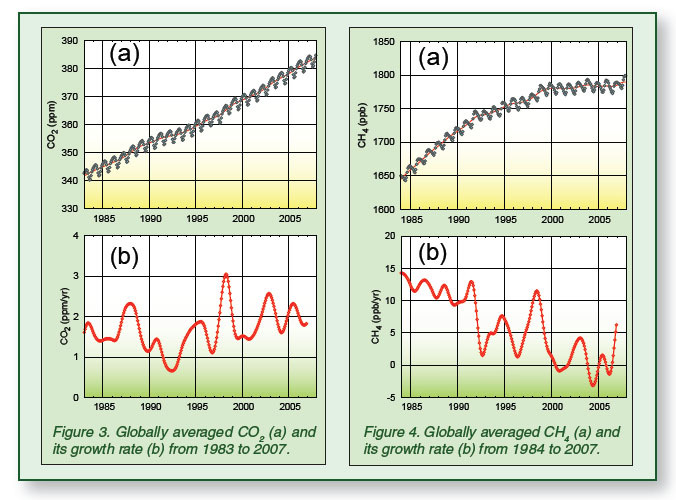 " Levels of climate-warming greenhouse gases continue to increase in the atmosphere. 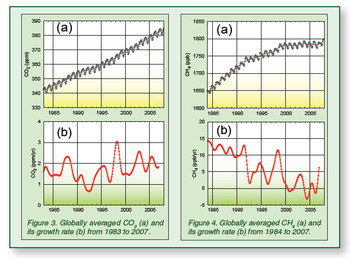 In 2007, global concentrations of carbon dioxide again reached the highest levels ever recorded. These latest numbers, published today in the World Meteorological Organization’s (WMO) 2007 Greenhouse Gas Bulletin, continue the trend of rising emissions of greenhouse gases since the Industrial Revolution. The latest numbers show that carbon dioxide reached 383.1 parts per million (ppm), an increase of 0.5 percent from 2006. Concentrations of nitrous oxide also reached record highs in 2007, up 0.25 per cent from the year before, while methane increased 0.34 per cent, exceeding the highest value so far, which was recorded in 2003. 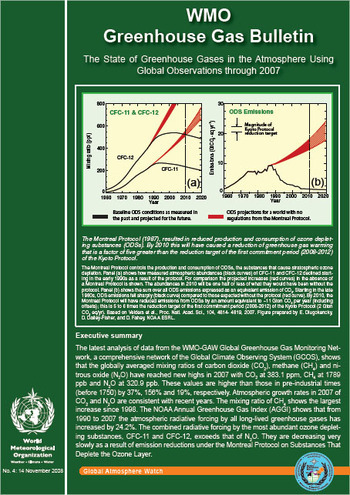 Using the NOAA Annual greenhouse gas index, the total warming effect of all long-lived greenhouse gases was calculated to have increased by 1.06 per cent from the previous year and by 24.2 per cent since 1990. In the meanwhile, levels of chlorofluorocarbons (CFCs) continue to slowly decrease, a result of emission reductions under the Montreal Protocol on Substances that Deplete the Ozone Layer.